In September of this year it was announced that a brand new government-funded bank will soon be launched with the main aim of helping small to medium businesses (SMEs). A statement from Vince Cable, the business secretary, emphasised the need for small to medium businesses to be able to borrow small sums of money at reasonable interest rates. The new bank will be aiming to attract private sector funding in the hopes of being able to release around £10 billion to lend to small manufacturing businesses and other similar enterprises. These loans will be specially tailored towards the needs of SMEs, with flexible repayment schedules, lower interest rates and lower minimum loan amounts. Saving money and cutting costs are essential to any SME. They may have smaller overheads than larger companies but there is usually more risk involved as any negative impact on income is felt severely. As a smaller business there is less room for any loss to be absorbed. Being able to use websites to shop around for the best deals on electricity has helped in recent years, but more is still needed. The government has announced plans to help small businesses by offering grants and other forms of financial aid. The opening of the new bank is just one part of a larger plan to aid independent businesses in the struggle against retail giants and multi-nationals. The announcement of the new bank follows hot on the heels of similar schemes being put in place by some of the best known high street banks. Lloyds TSB and the RBS have introduced lending schemes aimed solely at SMEs. Some packages allow for a minimum borrowing amount of just £1,000, and some have lower interest rates. They also offer greater flexibility in terms of repayment schedules than most other loans. These banks have been able to offer these packages due to the same government initiative to help small to medium enterprises that has prompted the launch of the new bank. The coalition government has made promises to help out smaller business owners and so far it seems these promises will be kept. Sounds like a possibly good deal. As an owner of a small business I can attest to how something can have a negative impact on business. Thankfully we’ve not needed a loan and hopefully will not need one in the future. It’s at least good that someone is focusing more on small businesses. They would probably have the toughest time securing funding. 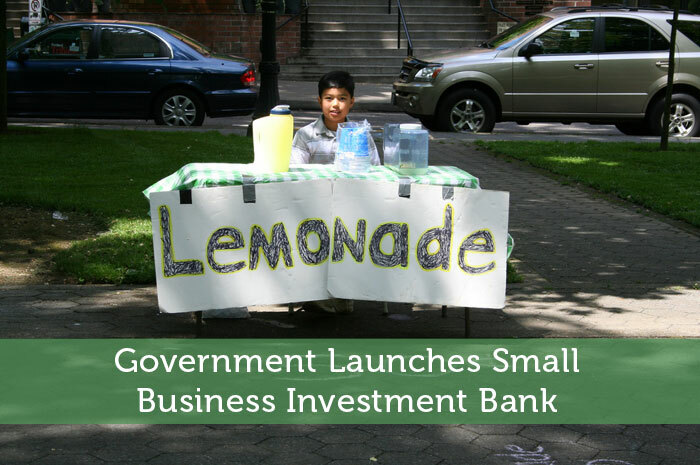 I think a small business lending bank is a good idea. It can be very difficult to procure funds as a small business, but a bank dedicated to lending to SME’s could offset that challenge. Yes it really is a good idea. I could see other banks turning down small business loans since they may have limited assets or other obstacles. Someone should be there to help those kinds of businesses. As long as the business aren’t going too much into debt, then it’s probably an okay thing. At least Make it cheaper can save them some money on their monthly bills! The key is that business owners are responsible with their loans. They should only take on as much debt as absolutely necessary and have a solid plan to pay it back. I’m with you Jason. I think its a great idea, my only fear is the lending becoming too loose, and the bank becomes another government disaster. Borrowing money is the worst decision you can make for your new business. The easiest way to lose it and end up in bankruptcy. Especially if its a government loan. If you can’t pay who knows what will happen to you and your assets. I recommend people start off with a business that they can start with self funding. Even if it’s only $1000. Try to first turn this into $2000. If you are successful, BOOM you are in business. Just keep growing it. If you fail well your losses stop at $1000. Why borrow $20,000 and owe interest payments because you expected to make $30,000. You know how many people expect to make money and don’t? I wouldn’t borrow money for a new business, but I can see it’s place for an established business that is on the verge of growth. For my taco seasonings, my dream is to one day be on grocery store shelves, but I have yet to come to a scenario where I could reach that level organically instead of borrowing to pay for costs that wouldn’t get paid for 60 days after delivery. Your taco seasoning business is a good example of a business that might be too tough to grow without investing money into it. It would be pretty tough to pitch to grocery stores without showing that you have the capabilities to produce a large quantity. I think a vast number of business owners would strongly disagree with you Jacko. How many businesses can realistically be setup with a mere $1000? If you chose to start a business with such limited funds, you’d be severely handicapped. You might not be able to afford the necessary equipment, hire necessary staff or do any advertising. Sure if it’s one of the few industries that you can realistically start on the cheap, you should go that route. A lot of people don’t have that option when their business idea isn’t cheap. Small businesses are really important here in the US too. It’s good to see that north of our border you guys are focusing on helping them also. We (our government) could probably learn a lesson or two too. Actually the writer was referring to the UK since they mention British Pounds. I’d think small business is important everywhere though. Opportunities would be so much more limited if big businesses completely dominated every industry possible. It’s great to see the intiatives to help out small business. Many of them get denied by bigger banks. At times, a small business owner may need to leverage borrowed funds. I suspect those are the exact small businesses they are targeting with this service. Big banks have become pretty wary of lending money to small businesses. I wish we had similar involvement here in U.S. Instead, we dedicate one day out of the year to shop with small businesses. Hmm, wasn’t there some crowd funding initiative being pushed through not long ago? I’m curious to see what’s going on with that. Many people opposed crowd funding. I didn’t even know about that small business shopping day. A single day of shopping really doesn’t help much on its own, but I guess it’s more about raising awareness. I don’t know anything about the crowd funding initiative either. It would be nice to have an organization that works with small business. The SBA in the US is supposed to be that way, but I’ve found it difficult to secure financing with that route, and there aren’t a ton of lenders who offer it based on the government involvement. That’s too bad that the SBA is not easier to work with. I guess they still want to keep things strict to avoid having banks deal with businesses that don’t have some kind of collateral or a history of success. Big companies definitely use predatory tactics to close down small business competitors. With their huge cash reserves they can undercut prices to the point of not being profitable just to ensure others can’t compete. They also use their power to secure the very best locations and drastically outspend competitors. We need to preserve small businesses to keep those bigger companies honest and keep opportunities open for other new business owners. I am EXTREMELY dubious about this. The coalition (and the previous government) have been banging on about how banks should be lending to small businesses that need it, but it hasn;t really happened, and although Lloyds, for example, may have a scheme, they haven’t really been following through on it. Also, it does seem a bit stupid to be setting up a new bank “to attract private investment”, in view of the fact that we already had a nationalised bank in the form of Northern Rock, and although that was tax payer funded, it was sold off at a loss to the tax payer. Surely, if they really believed this was going to work, they could have used NR, an existing bank, already under government control, to set the scheme up which would also potentially have added value to NR, improving the return to the tax payer when it was sold off. Very interesting. There must have been some kind of reason to not use NR. I guess they wanted a separate entity to focus specifically on small businesses to attract investors who are more interested in invested in small business. They must’ve determined that NR wouldn’t be able to meet that need on their own. I don’t really know the specifics of the situation though. So for all I know maybe it was nothing more than a political stunt to make it look like the government was focusing on small businesses more. I think it might be to do with the Chancellor being right wing, and not wanting a state owned bank, and the Business Secretary being a liberal. That’s the thing with a coalition government, not everything’s as joined up as it could be. I have really mixed feelings on this, one one hand I am happy that hey are trying to spur on growth by lending to small businesses. On the other hand I really hate how ingrained the government is becoming in every facet of society. Sometimes the free market needs to run its course and not be held back by an overzealous and over bloated government. Then you’d really hate living in British Columbia. The government runs way more than it really should, including car insurance, electricity, liquor stores and more. In some cases we have no choice but to use the government option. It won’t be state owned, they’re looking for private investment to fund it. Our current government is conservative.